OTTAWA — For the second spring in a row, forward Dale Weise is finding ways to score big goals for the Montreal Canadiens. Weise scored his second goal of the night at 8:47 of overtime to lift the Canadiens to a 2-1 victory against the Ottawa Senators on Sunday and a 3-0 lead in their best-of-7 Eastern Conference First Round series. Game 4 is Wednesday at Canadian Tire Centre (7 p.m. ET; USA, CBC, TVA Sports). Weise, who scored with 5:47 left in the third period to tie the game, has five goals in the past two Stanley Cup Playoffs; three of them are game-winners. “I don’t know if you can call me that yet,” he said. “I thought I had some good chances early in the series and just couldn’t put them in; a couple of 2-on-1’s and hit posts. I don’t know what it is. Just every game gets so intense, you’re so focused, I don’t know. I don’t really have answer for you. Weise scored the winner on a wrist shot from the left faceoff circle to the short side of Ottawa goaltender Craig Anderson. “I was just trying to keep it short side so I didn’t rip it around the boards if I miss the net, and it managed to go in,” Weise said. Senators coach Dave Cameron opted to start Anderson for Game 3 after Andrew Hammond gave up seven goals in the first two games. Anderson, who played four games after sustaining a bruised hand Jan. 21 and lost the starting job to Hammond, made 47 saves. Canadiens goaltender Carey Price made 33 saves. Montreal defenseman P.K. Subban marveled at Weise’s ability to score in big games. “He’s a beauty. Let’s leave it at that. I love him,” Subban said. “There’s guys that have made careers on that, just finding a way to get it done, and listen, he’s found a way. The Senators came out and played a physical game against the Canadiens. They had 27 hits in the first period, 61 for the game. For the third game in a row, Ottawa had a 1-0 lead after the first period, this time on a goal by Clarke MacArthur, his second of the playoffs. It was still 1-0 after two periods. The Senators, who were outscored 6-2 in the second period of the first two games, were outplayed but protected the lead this time. “We played solid throughout the game,” Senators captain Erik Karlsson said. “They did a good job and they made it hard on us. We couldn’t put the puck in the net, and that was the only thing that was wrong with us. We came out, we dictated and we showed that we wanted to win the game more than they did. The Canadiens were 0-for-6 on the power play; they are 1-for-13 in the series. The Senators went 0-for-2. “It was a close one,” Anderson said. “It’s frustrating. The guys battled so hard, played so well and to come up short is frustrating. Subban said the Canadiens are wary of the Senators, who went 23-4-4 down the stretch to earn the first wild card position. Weise tied the game after Anderson stopped a shot by Montreal’s Brandon Prust. Play paused a moment when the puck popped up in the air, then Weise batted it down and shot it into the open side of the net. The Senators survived a delay of game penalty to defenseman Mark Borowiecki with 3:42 left in the third period after he chipped the puck into the crowd. 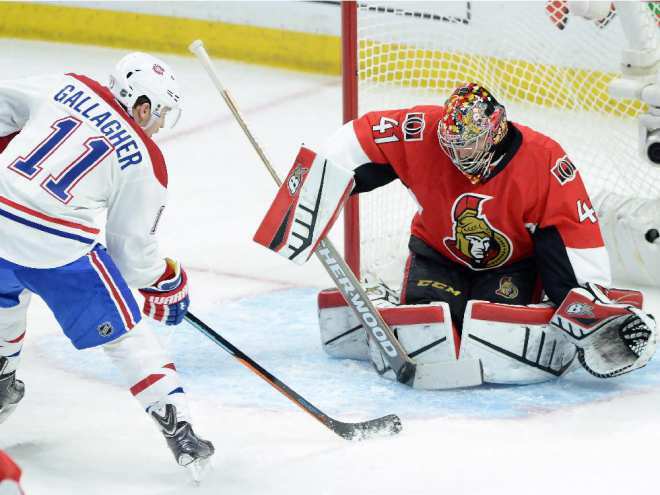 In overtime, Anderson made a brilliant glove save on Montreal’s Jeff Petry after Ottawa’s Curtis Lazar was sent to the penalty box for boarding at 6:13, but Weise ended it 2:34 later, moving the Senators to the brink of elimination.